We’re expecting! — And, again, it’s twins! We are always excited to add to our little family of “purpose centered” businesses, and we are anxious to share the news. If the powers greater than ourselves are willing and the creeks don’t rise, the hospitality stork will deliver a spanking new hotel with its loving sister restaurant to Greensboro in 2006. We’re still debating the names. 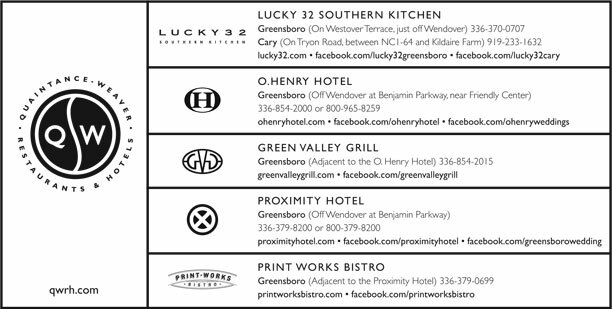 We’re sure that the hotel ought to be named “Proximity” but it might be “Proximity Hotel” or “Proximity Loft Hotel.” And the restaurant could be called the Proximity Grill, Proximity Kitchen, Proxy Kitchen, Revolution Grill (this is a play off Greensboro’s “Proximity Mill” and “Revolution Mill”), or any number of impressive suggestions that we would be delighted to receive as the result of this exclamation of our indecision (dennisQ@qwrh.com). Read on and you’ll see a piece clipped from The Business Journal of the Triad about all of this. Plus, with the holidays just around the corner, we’ll share some ideas about how we can help you “juggle things” with “jingle bells” in the air. For instance, we have private or semi-private dining for holiday parties at all of our Lucky 32 restaurants, “Thanksgiving to Go” from the Green Valley Grill, holiday event catering at the O.Henry, a “no-hassle” way to get Q-W gift certificates and a real value for your out of town guests at the O.Henry. If you’re planning a party for the holidays, please consider having it at the O.Henry Hotel. Whether it’s an intimate gathering of 15 or a big bash of 150 (or something in between), the O.Henry Hotel’s attentive staff, gracious amenities and elegant banquet facilities will make your party a success. Contact one of our Catering Consultants, Heather Tuttle or Leslie Dupuis, at 336-544-9615 or info@o.henryhotel.com for more information about planning your party at the O.Henry Hotel. Our Lucky 32 restaurants are also options for holiday gatherings. We offer our full menu in our private and semi-private dining areas. Plus, we also offer reservations, call-ahead seating and a pre-ordering service that expedites service for larger parties. In North Raleigh our “Starlight Room” seats up to 32 guests and in Cary our elegant semi-private dining room seats up to 50. Our Greensboro Lucky’s private dining room seats 8 – 10 and in Winston-Salem up to 40 guests can enjoy semi-private dining. Call one of our General Managers (see below) for more information or to make reservations, and visit lucky32.comfor our full menus. GREENSBORO – Let’s dispatch with the news first. Greensboro-based Quaintance-Weaver Restaurants & Hotels, which recently brought the city the luxury O. Henry Hotel and upscale Green Valley Grill, is getting ready to do it again. Sort of. The hospitality firm is planning a $20 million, eight- story, 150-room hotel in Greensboro, tentatively called the Proximity Loft Hotel. Rooms will be roughly 20 percent less expensive than the O. Henry (which costs about $160 per night), and the restaurant will be smaller. But that’s just the beginning. Dennis Quaintance, president of the firm, expects to have no fewer than six more Proximity hotels in North Carolina within 15 years. “If we can’t do that, we shouldn’t mess with it,” he says. Quaintance hopes to build this new hotel near the O. Henry, but the exact piece of land hasn’t been locked up yet. Regardless, the best part of this story is understanding a little of how a $20 million idea comes into being. It began one Sunday last spring, with Quaintance and his wife/business partner, Nancy, walking briskly through their Fisher Park neighborhood. They were lamenting the fact that after three years of trying to make the numbers work, they had to give up on building an O. Henry in Raleigh. Both were eager for another big project, so the question arose: where is the hole in the hospitality market, not just Greensboro, but overall? The highly creative, high-energy couple tends to generate more ideas in a day than most of us do in a year. Soon, Nancy offered this gem – let’s do for hotels what Target has done for shopping: offer high-style and fashion in an affordable way. OK, but how? Nancy thought a moment more. People like renovated places. Spacious, full of light. Let’s find a factory with big windows and convert it into a hotel with loft-like sensibilities. immediately began sketching floor plans and facades. Later, they drove all over town looking for the perfect property to reclaim. Naturally, it does not exist. “No way are you going to find the right property in the right location,” he says. So the idea quickly evolved: Build a hotel with spacious rooms, tall ceilings, exposed ductwork and huge windows – and make it look like it was once an old textile factory. The name helps some. Proximity Cotton Mills once operated in Greensboro. The idea, however, wasn’t a go yet. In the unusual hierarchy of the Quaintance-Weaver enterprise, few big decisions come top down. Instead, Quaintance runs ideas past his top three management executives – Will Stevens, Bart Ortiz and Jim Slowin. In order to encourage and nurture entrepreneurial instincts, the four shift into “possibility mode.” Ideas are pitched without judgment. The only feedback is positive, or none at all. Thus, crummy ideas die a natural death, and no one gets embarrassed. Still, Quaintance requires validation. He calls himself a “reluctant entrepreneur” who always keeps an eye on the backdoor. He was prepared for the loft hotel idea to die – if his managers didn’t embrace it. “Dennis has put together a team that works for a set of values; we don’t work for Dennis,” Stevens says. “We also all have different traits. That’s important. Dennis throws out a lot of ideas. A lot. We have to decide what’s a concept, a developable idea or an action plan. Little by little, the concept grew into a plan. That’s when Quaintance decided he was “willing to get $50,000 pregnant” before pulling the trigger. Soon, a construction consultant and design engineers were hired to do some rough pricing. A month ago, a consultant from Denver flew in to do a market analysis. Later, the sales staff started talking to corporate clients. The stars were lining up. This week, a formal design team meeting was held, complete with Centrepoint Architecture from Raleigh. Quaintance says the property should be open by mid-2006. He already envisions two in Charlotte and two in the Triangle. Stevens can see two more in the Triad, and one each in Wilmington and Hickory. Quaintance is fully aware that Proximity, in the short-run, will steal customers from the O. Henry. That’s OK, he says. The city, while saturated with limited-service hotels, has room for more full-service properties. Plus, he’s placing a bet on the Triad’s future. Our restaurants won’t be open for regular business on Thanksgiving Day, but we’ve still got options for dinner if you’ll be in Greensboro. The Green Valley Grill will have Thanksgiving dinner ready for you to pick up, take home and enjoy. Place your order by 10:00 pm, Sunday, November 21, then stop by the Green Valley Grill on Thanksgiving Day to pick up your juicy, wood-fired, rotisserie-roasted turkey with all the trimmings, including sides, salads, bread and dessert. For more information or to place your order contact the Green Valley Grill at 336-854-2015 or visit greenvalleygrill.com. We appreciate the support we get from our neighbors so we are offering a “Neighbor’s Rate” around the holidays. A special, reduced rate of $139* ($70 off our regular rate of $209) will be available November 21—December 4, December 10—30, 2004, and January 1—9, 2005. Contact our Reservations Manager, Ana Abella, at 336-544-9603 or toll-free 800-965-8259, or visit o.henryhotel.com for reservations or more information. *Rate does not include tax, based on double occupancy, subject to availability, and valid only on the dates listed. Our gift certificates are (we say, not so humbly) wonderful holiday gifts. So wonderful, in fact, that we often have a line at the front desk in December. We’re thrilled, but we’re embarrassed when you have to wait. Our Gift Certificate Hotline helps with this issue. You can order gift certificates for all four Lucky’s, the Green Valley Grill or the O.Henry Hotel. We’ll take your credit card number and mail them to you promptly. This is not a sales pitch – we just want to help you avoid the holiday crunch by offering an option. Order online at qwrh.com or call 336-370-0966 and ask for the Gift Certificate Hotline. Let us help you find more time during the busy holiday season. You call, we cook, then we bring your order right to your car. We especially like the “Family Dinner” options and the “One Stop Wines” that are priced low. For complete Get Lucky & Go menus visit lucky32.com or just give us a call – phone numbers for all four locations are on the back page. We love this Southern classic (with a Lucky’s twist) on a toasted cheese sandwich, over a burger or topping a grilled chicken breast with bacon. Add mayonnaise and lemon juice to a mixing bowl. Whisk with a wire whisk until well combined. Add grated cheddar cheese and diced roasted red peppers. Mix with a kitchen spoon until ingredients are evenly distributed. ©1989-2004 This recipe is property of Quaintance-Weaver, Inc. Unauthorized commercial use is forbidden. Every month or so our featured menus at Lucky 32 and the Green Valley Grill change to reflect the season. At Lucky 32 each menu features an American regional cuisine, while the Green Valley Grill features menus that are inspired by European regional recipes. Visit our Lucky 32 and Green Valley Grill websites for our upcoming featured menus.